122510 Private James Skelhorn 8th Battalion, the Machine Gun Corps (Infantry) was killed in action 28 March 1918 and is buried at Heath Cemetery, Harbonnieres. He was 21 years old and is commemorated on Evenwood War Memorial and the Roll of Honour, St. Paul’s Church, Evenwood. By 1911 the family lived at 48 Murray Street West Hartlepool and 55 year old James worked as a boot repairer. He had been married to Elizabeth for 15 years and Mary Ellen aged 12, John Herbert aged 5 and an unnamed baby girl aged 1 month lived with them. There is no mention of James who would have been about 15 years old. His whereabouts in 1911 have not been traced. James Skelhorn enlisted at Bishop Auckland and joined the Durham Light Infantry being given the regimental number 73013. At some time later he joined the Machine Gun Corps being given the regimental number 122510. The service details of Private James Skelhorn have not been traced therefore the date when he enlisted into the DLI and the date he transferred into the Machine Gun Corps remain unknown. Prior to January 1918, the machine gun companies were attached to infantry brigades or squadrons attached to cavalry brigades and were armed with 16 Vickers guns (cavalry Machine Gun Squadrons 12 guns). They took the brigade number ie 19 Machine Gun Company of the 19th Brigade. There were 288 Infantry MG Companies and 26 Cavalry MG Squadrons (Sqns.) A Major became the Brigade Machine Gun Officer, a Captain commanded the Company (Coy.) of 16 guns. A MG Coy consisted of an HQ, 4 Sections of 4 guns and a Transport Section. Sections were divided into 2 sub-sections each commanded by a subaltern, the senior being the Section Commander. Sub-sections each had a Section Sergeant and a Section Corporal. Transport Sections of mule drawn limbers for guns/ammunition were larger than an infantry battalion’s transport. Cavalry MG Sqns had 6 no. 2 gun sections. Officers and men of the Corps earned 7 VC’s, 292 Military Crosses, 779 Distinguished Conduct Medals, 3653 Military Medals and 156 Bars, 276 Meritorious Service Medals and many foreign decorations. 170,500 officers and men served in the MGC. 62,049 were casualties; killed, wounded or missing. 3 March 1918: Soviet Russia made peace with Germany which meant that Germany could transfer divisions from the Eastern to the Western Front. More importantly, these Divisions included the original elite of the German Army, the Guards, Jagers, Prussians, Swabians and the best of the Bavarians. In all 192 Divisions could be deployed in the West so that the Germans held superiority in numbers. The Allies could field 178 Divisions. A single division numbered about 19,000 men so the German High Command could call upon about 3,650,000 men as opposed to the Allies 3,380,000. It was essential that final victory was gained before the American Forces arrived in Europe in huge numbers. America had entered the war 6 April 1917 and the first of her troops arrived in France 26 June 1917. In July 1917, the U.S. Commander in Chief of the American Expeditionary Force General J.J. Pershing asked for 3 million men. The build-up of troops took time but eventually by June 1918, the Americans were receiving about 250,000 men a month in France. This amounted to 25 divisions in or behind the battle zone and another 55 in the United States. The French were able to draw on a new annual class of conscripts after a year of effective inactivity. However, the British were worn down by continuous fighting following the major offensives at Arras, Messines, Passchendaele and Cambrai during the summer of 1917. The strength of the British infantry had fallen from 754,000 in July 1917 to 543,000 in June 1918. The German High Command calculated that it required 200,000 replacements each month but even by drawing the next annual class of 18-year olds, only 300,000 recruits stood available. Also 70,000 convalescents from hospitals were available each month but even counting them, the strength of the German Army had fallen from 5.1 million to 4.2 million men in the 6 months of the offensive. It could not be increased on the estimated scale required. Added to this the poor diet of the German troops, battle fatigue, discontentment with the military leadership, social unrest at home and a general realisation that their great effort was beginning to wane, the Allies counter attack in mid-July began to seize the initiative. Sweeping victories over demoralised German forces eventually led to the resignation of Ludendorff 27 October, the abdication of Kaiser Wilhelm II 9 November and the signing of the Armistice 11 November 1918. The village of Rosieres had been located well within the British lines since the German withdrawal to the Hindenburg Line in the spring of 1917 but the swift advance of German storm-troopers soon saw the village under attack. The Fifth Army retreated and was involved in some extremely fierce and sacrificial fighting. The German Army swept through the old Somme battlefield to the east and aimed to reach Amiens. The British Fifth Army retreated and held positions to disrupt the enemy. 27 March: 8.00am – the enemy attacked the Rosieres line. On the left and the centre they were driven off but on the right a Labour Company fell back until a counter attack restored the situation. The 50th Division had practically been reduced to the 149th Brigade which was holding 4000 yards of line between the 66th and 8th Divisions. The retirements north of it had led to a warning order for a withdrawal being issued but this had been misinterpreted by the battalions in the line which began to fall back, abandoning Vauvillers near the junction of the 66th Division. The position at Vauvillers was held until noon at which time they withdrew because the troops on both flanks had retired. Noon: an attack developed along the whole of the front line held by the 8th, 50th, 66th and 39th Divisions. 1.00pm: the 66th retired. 2.00pm: 5th Battalion, the Northumberland Fusiliers retired (part of the 149th Brigade) The 8th Division which had once formed a defensive flank attacked on the right while on the left the 7/DLI and the 22nd Entrenching Battalion with some 66th Division Reserves went forward. 3.00pm: these troops, well supported by artillery were under way and struck the enemy who was advancing in 8 or 10 waves. They drove the foremost waves back and re-established the 50th Division line, recapturing Vauvillers. Brigadier-General Riddell led a counterattack and drove the enemy from Harbonnieres – very heavy losses inflicted on the enemy. The success was only temporary. The Germans attacked again and when ammunition began to run out, broke in south of the village and enfiladed the line causing another retirement. 7.00pm: the line withdrew to the light railway between Rosieres station and crossroads half a mile to the east. A counter attack was organised and the 50th Division was back on the light railway to the east of Harbonnieres. 8.00pm: the enemy made another determined attack, advancing in 12 waves but was repulsed again. 27/28 March: the allied line, south of the Somme, ran from Mesnil-St. Georges, west of Montdidier) to Hamel via Boussicourt, Arvillers, Warvillers, Rosieres and Haronnieres. 28 March: the 8th Division together with the 16th Brigade, the Royal Horse Artillery defended Rosieres But these troops were withdrawn at night. 26 March: at dusk, the 39th Division manned the Proyart sector; Malcolm (?Div) was south and west of Framerville and north east of Vauvillers; and the 50th Division continued the line to Rosieres. The 8th Division under Heneker were in the line to the south west in the vicinity of Warvillers. The map below shows the disposition of British forces in the Harbonnieres – Framerville area. At Rosieres the right flank held firm and the Northumberland Fusiliers and a battalion from the 8th Division made a fine effort to recover Vauvillers. The Germans were in no state to continue, exhaustion from the struggle and perhaps attraction to captured Allied provisions, the night had been cold, British platoons and companies were mixed up, the retreat continued to the general line Ignaucourt-Marceleave. 28 March: an effort was made to recapture Lamotte by the 61st Division and the First Cavalry attacked from the west but without artillery and no cover they were at the mercy of German machine-guns and at dusk, the Germans attacked Marceleave. The village fell. “Some men rally at once though German machine-gunners have taken the wood south east of Guillaucourt and their fire enfilade is a hail of torture. British troops from Caix entered the battle and the Germans retreated back to Guillaucourt. The hill was saved but enemy machine-gunners continued their assault from the copse south east of Guillaucourt and “many a good man is killed”. The retreat reached Hangard the next day. The Fifth Army held out. The 66th Division was relieved by the 18th. 2 April: The remnants of the 50th joined the unwounded of the 20th and were relieved by the 14th Division. Amiens was not taken. Private James Skelhorn was killed in action 28 March 1918. Whilst his service details and the 8 Bn., MGC War Diariy have not been researched it is assumed that he died during action at the Battle of Rosieres. There can be no doubt that men like Private James Skelhorn, a machine-gunner would have been in the thick of fighting. He could have been involved with the Northumberland Fusiliers at Harbonnieres or the Guillaucourt-Caix road skirmish. He is buried at Heath Cemetery, Harbonnieres which is located to the north of Rosieres. Private J. Skelhorn was awarded the British War and Victory medals. 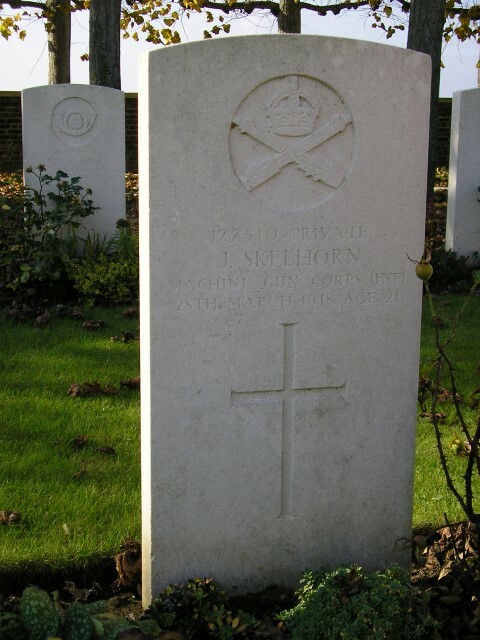 Private James Skelhorn is buried at grave reference V.I.6 Heath Cemetery, Harbonniers. Heath Cemetery is located to the south of the Amiens to St. Quentin road approx 13km from Villers-Bretonneux. This cemetery was made after the Armistice when graves were brought into it from other burial grounds on the battlefields between Bray and Harbonnieres. The majority of casualties died in March or August 1918. There are 1491 burials and memorials. To either side of the figure and at a slightly lower level is a bronze machine gun covered by 2 laurel wreaths and on the back of the central pedestal is inscribed a short history of the Corps. 1911 census & A family tree on the ancestry website provides details to confirm that James (1852-1919) was his father and Elizabeth (nee Bowman 1871-1959) was his mother and Mary, Herbert, Clara and Amy Gladys were his brothers and sisters. “The Fifth Army in March 1918” W. Shaw Sparrow 1921, chapter 4, “The centre fighting” p119-135.